Introduced in March 1996, the network-ready LaserJet 5M was the enhanced follow-up to the LaserJet 4MPlus (not to be confused with the LaserJet 4MP). Using the new PCL 5e driver, the LaserJet 5M provided improved printer language support and memory optimization to handle large print files. A second paper cassette, additional memory, and a 75-envelope feeder are options to increase the LaserJet’s business productivity. 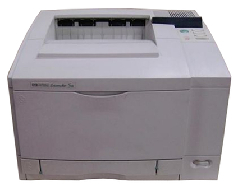 First introduced in March 1995, the 37-pound LaserJet 5M looks exactly like its sibling, the LaserJet 5. Like the 5, the 5M has serial and parallel ports to connect directly to a computer workstation. But the 5M starts out with 4MB of RAM, PostScript and has a JetDirect card for network printing via Ethernet to LocalTalk. Shortly after its release, HP increased the amount of memory on the HP LaserJet 5 from 4MB to 6MB. Three empty SIMM slots allow you to add up to 52MB of memory. Even if one chooses not to increase the default memory, the LaserJet 5M has firmware called Memory Enhancement technology (MEt) to optimize the memory to handle larger print jobs or complex pages. The LaserJet 5M comes standard with a 250-sheet cassette tray, capable of supporting 20-pound letter or legal-size paper. The flip-door reveals a 100-sheet multi-purpose tray that can handle transparencies, labels, post cards, envelopes, 3” x 5” postcards up to 8.5” x 14” legal paper of various bond weights. The LaserJet prints at 12 pages per minute, at normal resolution. At 600 x 600 dpi resolution, the LaserJet 5M keeps text sharp. HP’s Resolution Enhancement smooths curves and edges to improve image quality beyond the typical 600 dpi. The 120 levels of gray allow for clarity with graphic images. The LaserJet 5M comes with a Draft Mode to conserve on ink, and a Power Save feature to conserve on electricity. 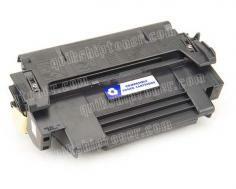 For wireless printing, the printer has a built in infrared sensor HP called FastIR. It was a good idea at the time, but the need for the IR to have line-of-sight, and the later introduction of the more flexible IEEE 802.11 wi-fi, rendered FastIR obsolete. For some reason HP isn’t very generous when it comes to supplying enough memory for their commercial machines. While most home-use laser printers on the market come standard with at least 8MB, HP equipped the LaserJet 5M with only 6MB of memory. If you want to use this as a network printer—and you can still find SIMM memory—max out memory. Review it: "HP LaserJet 5M "
While lagging in speed the LaserJet 5M has some of the largest toner capacity for a printer of it’s size. 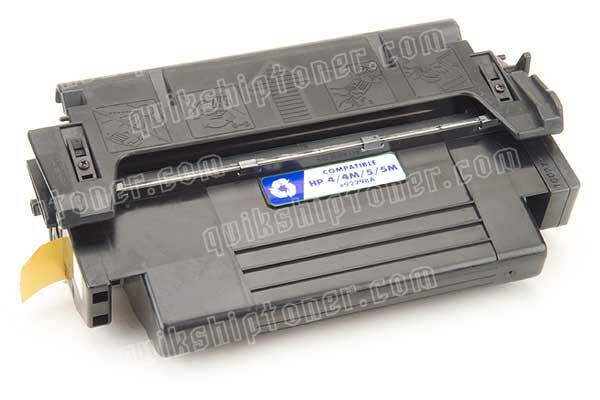 A standard size cartridge can print up to 6,000 pages before replacement. For really heavy printing, 8,800 and 10,000-page cartridges are available.